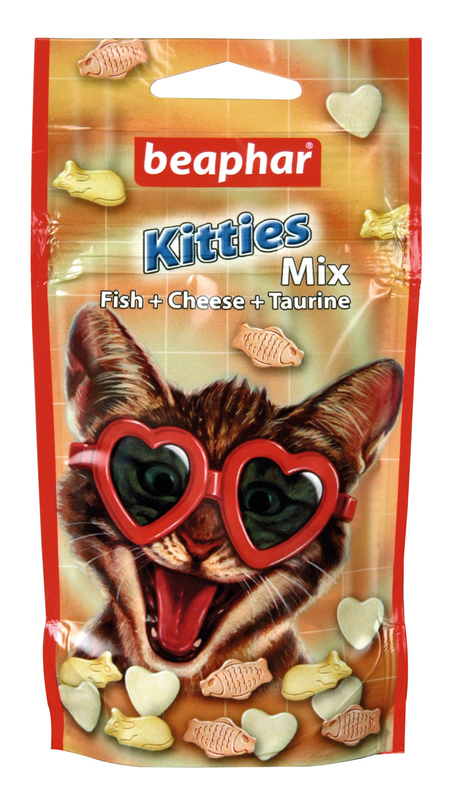 Kitties Mix from Beaphar are fish, mice and heart shaped cat treats which are made from milk-extracts and come in cheese, fish and taurine flavours. Cats just love these little treats. Milk and milk derivatives, Various Sugars, Minerals, Molluscs and Crustaceans (Min 4% Shrimp), yeast Milk and milk derivatives (4.3& cheese), Various Sugars, Minerals, Molluscs and Crustaceans (Min 4% Shrimp), yeast. Milk and milk derivatives, Various Sugars, Minerals, Fish and Fish Derivatives (mins 4% Codfish), Meat and Animal Derivatives, Yeast. Below are some recent questions we've received regarding Beaphar Kitties Mix Cat Treats, including answers from our team. Is this treat suitable for Kidney disease cat? May I know whether this treat is suitable for cats on a renal diet? If no, any other suitable treats? Thanks! Unfortunately these are not recommended for cats with renal problems. This is because the phosphorus levels would be too high. The Beaphar Kidney Support treats would be more suitable as these are designed for cats with renal problems.